Love the message: Loud and Clear! 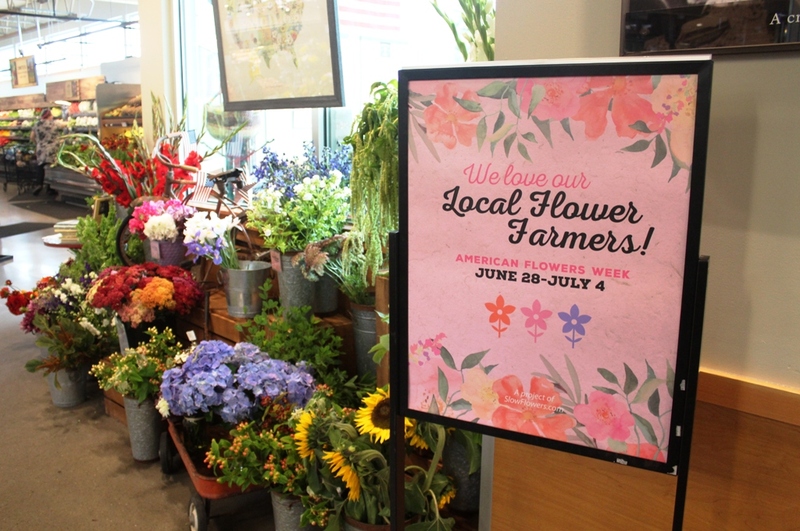 Just inside the entrance, this display greets customers of New Seasons’ Arbor Lodge store in Portland. 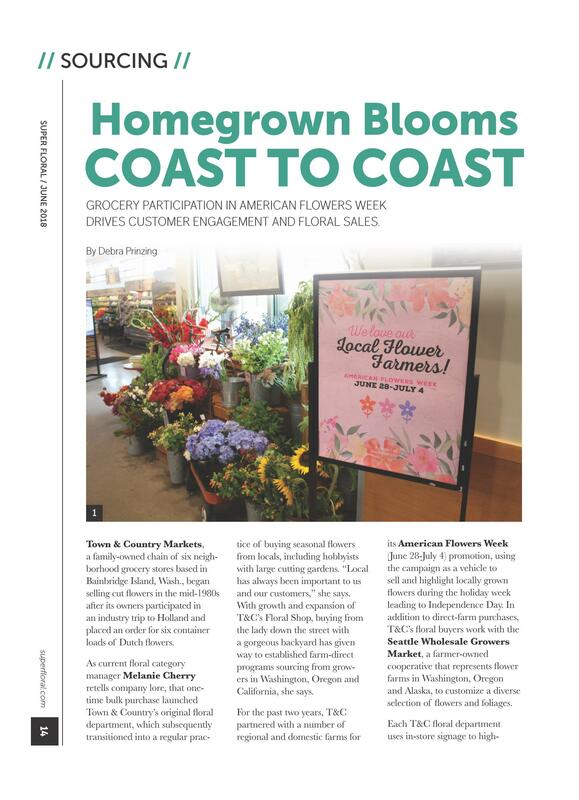 Thanks to suggestions from my flower farmer friends who sell to two of the Pacific Northwest’s most popular grocery chains, American Flowers Week took center stage in this region’s floral departments at Town & Country Markets and New Seasons Markets. 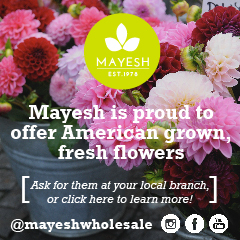 The chains adopted American Flowers Week as a vehicle to sell and promote locally-grown flowers during the Independence Day holiday week and incorporated our unique American Flowers Week label to alert their consumers about the origin of the flowers on display. In-store signage unique to each chain’s brand and staff members empowered to “own” the message with personality and creativity really paid off. 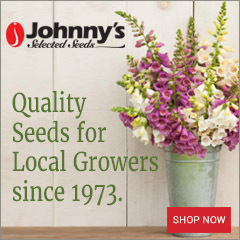 Town & Country Markets Inc. is a regional, locally-owned and operated independent grocery company founded in 1957 and based in the Seattle area and participated with American Flowers Week signage and bouquets throughout its six-store chain. 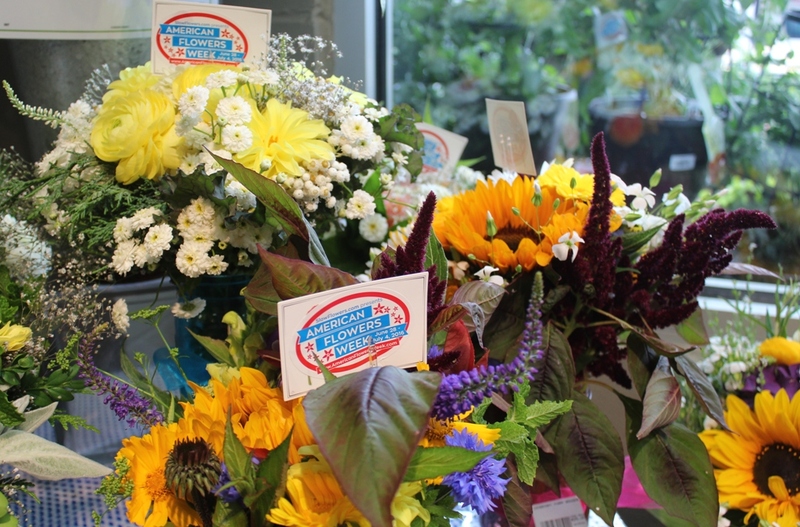 Tags appear on Town & Country/Central Market bouquets large and small to alert customers about the origins of each flower. 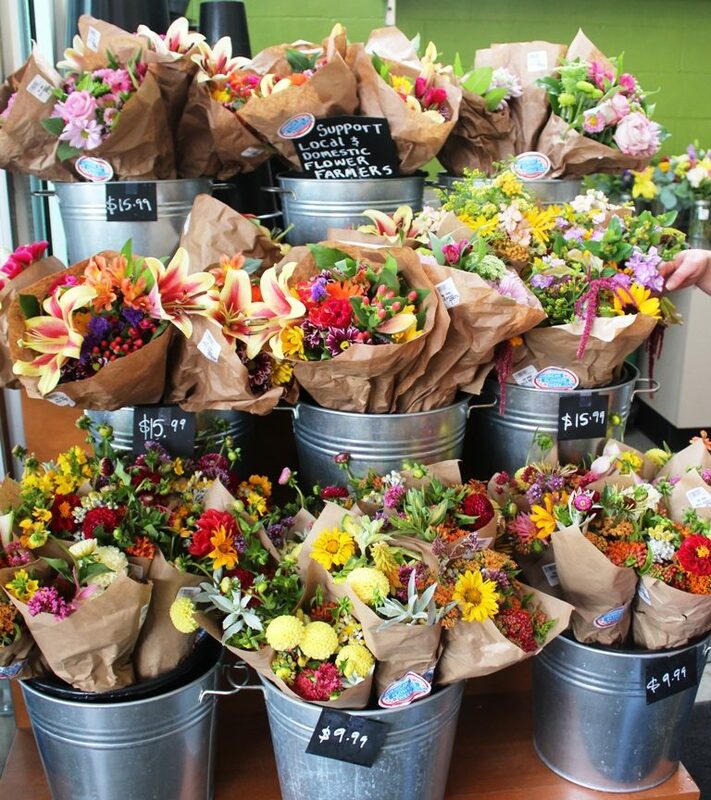 New Seasons Market is a Portland-based West Coast neighborhood grocery with 18 stores in three states and showcased flower bunches, bouquets and mason jar arrangements from Northwest and California farms. 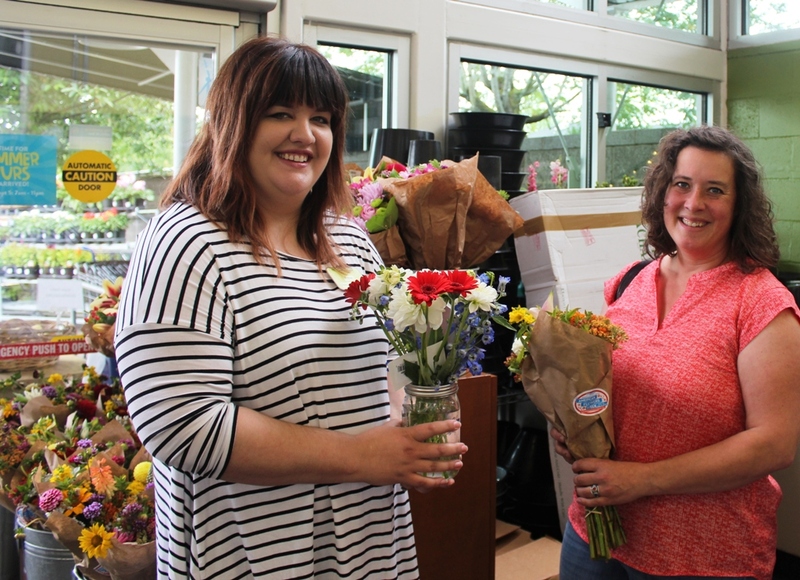 New Seasons’ floral manager Katie McConahay (right) with flower farmer Bethany Little (second from right) and team members Alaina and Guen (manager) at the Arbor Lodge neighborhood store in Portland. On Wednesday, June 29th, I headed to Portland bright and early to see the floral design entries for the Oregon Flower Growers Association’s American Flowers Week celebration (more on that cool program later this week). There, I met up with flower farmer Bethany Little of Charles Little & Co., a Slowflowers.com member and a Certified American Grown farm. 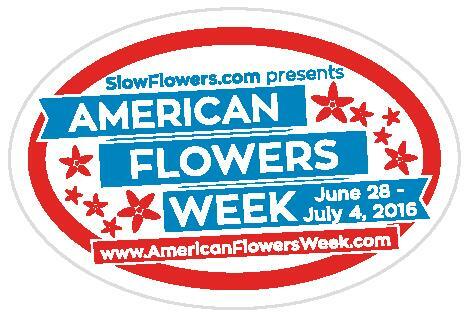 I love how they took the initiative to do something special and stimulate floral consumption during the week of July 4th! The idea has inspired me to work on similar efforts across the U.S. and has laid the groundwork for even more grocery promotions in 2017. Katie McConahay (floral buyer) and Bethany Little of Charles Little & Co. 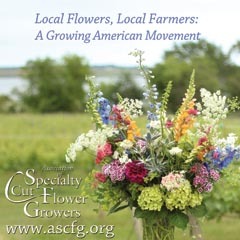 It was Bethany who called me about six weeks ago and suggested that I develop a bouquet label that flower farmers could use on their grocery and market bouquets. 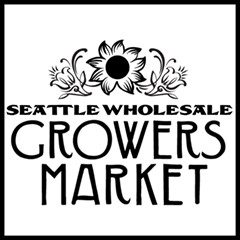 She and her husband Charles Little (past guest of the Slow Flowers Podcast) sparked the idea and also pitched it to Katie McConahay, New Seasons Market floral buyer. 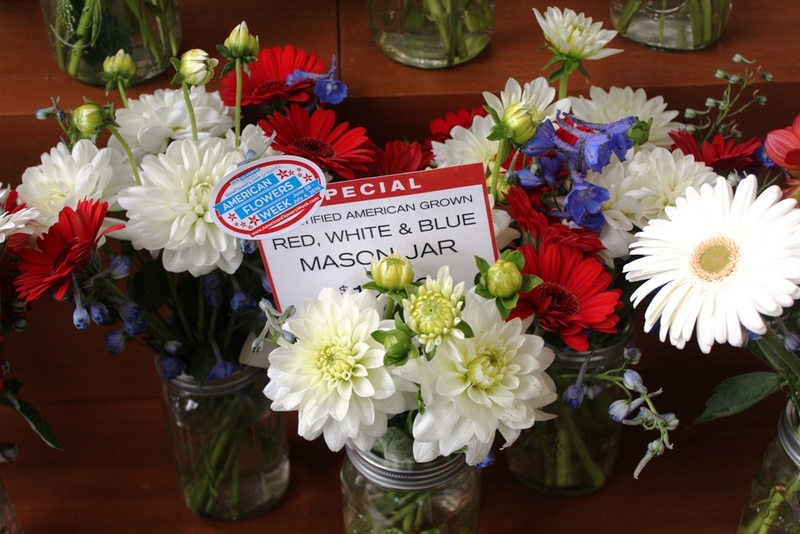 Certified American Grown Red-white-and-blue mason jars on sale for $12.99 at New Seasons. 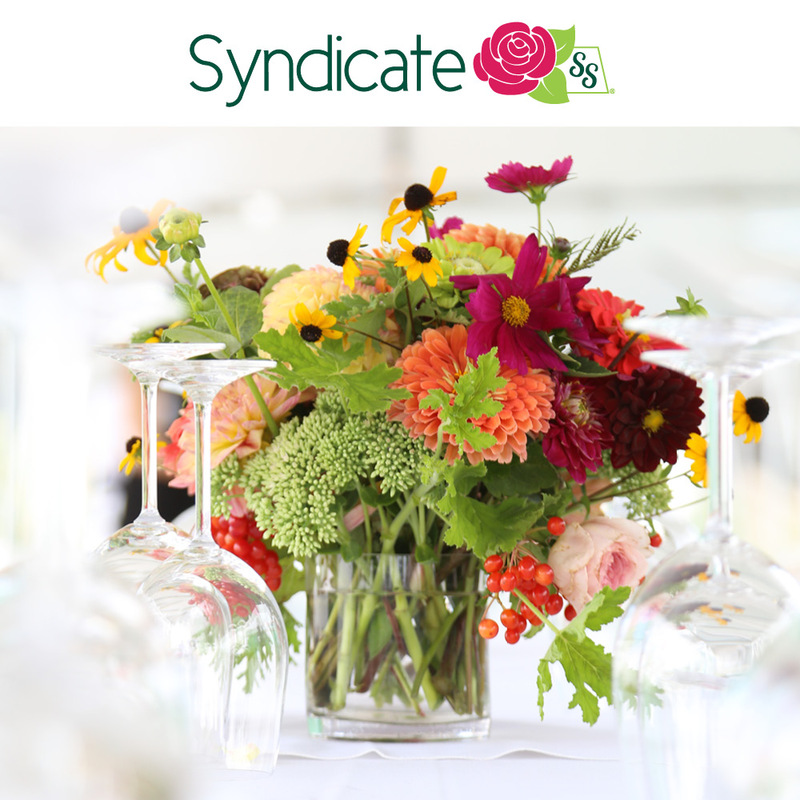 The bouquet featured red and white dahlias and gerberas with blue delhiniums. 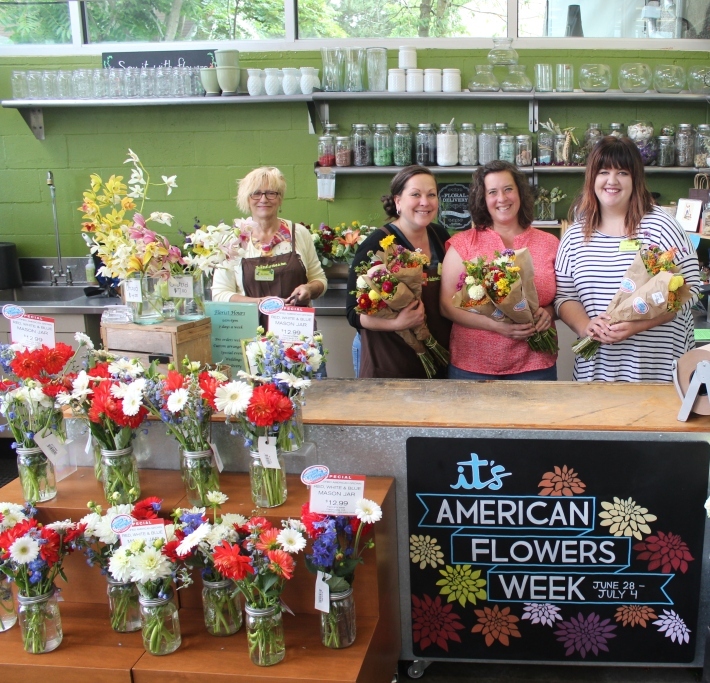 We headed over to a nearby New Seasons Market in Portland’s Arbor Lodge neighborhood where buyer Katie and store floral manager Guen Armstrong showed off the signage, product selection and product labeling for American Flowers Week. 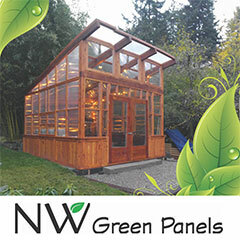 Katie has a reputation for consistenly supporting Northwest and California flower farms throughout the year. She discussed this philosophy on a past episode of the Slow Flowers Podcast, which you can find here. 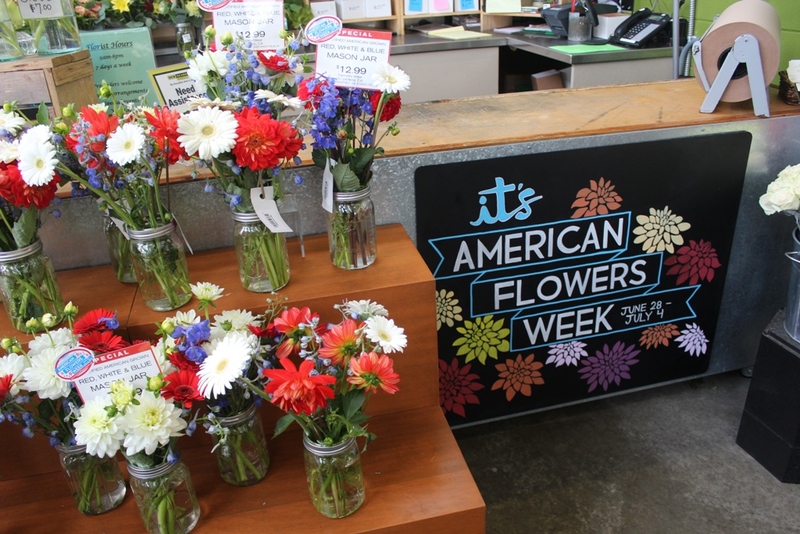 A huge variety of Northwest-grown mixed bouquets labeled with “American Flowers Week” at New Seasons Market. 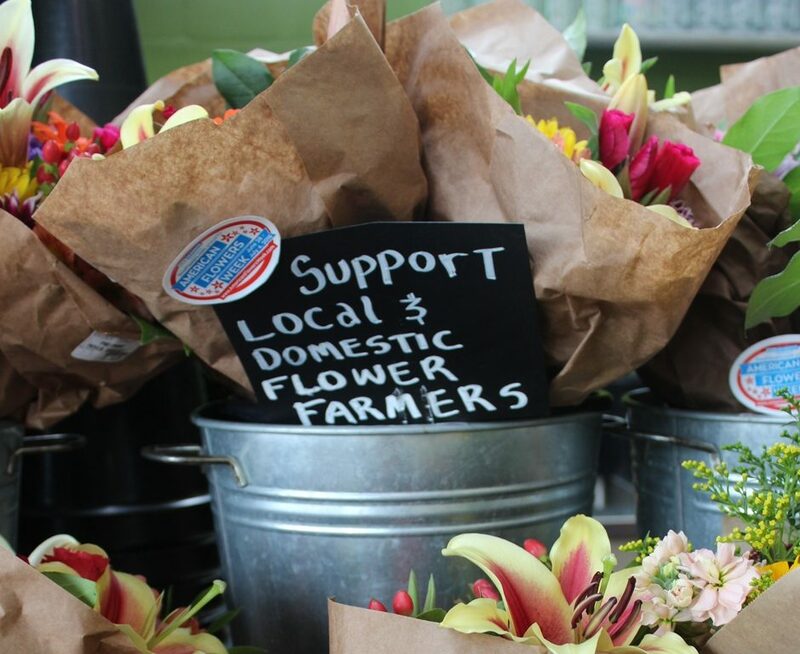 From the hand-lettered chalkboard signage to the adorable mason-jars filled with red-white-and-blue California flowers, to the abundant and lush mixed bouquets from farms like Charles Little & Co., Rain Drop Farms and other NW flower farms, the message was clear: We Love Local. 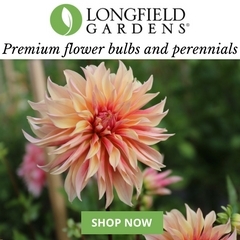 New Seasons also promoted American Flowers Week it is weekly circular and online. 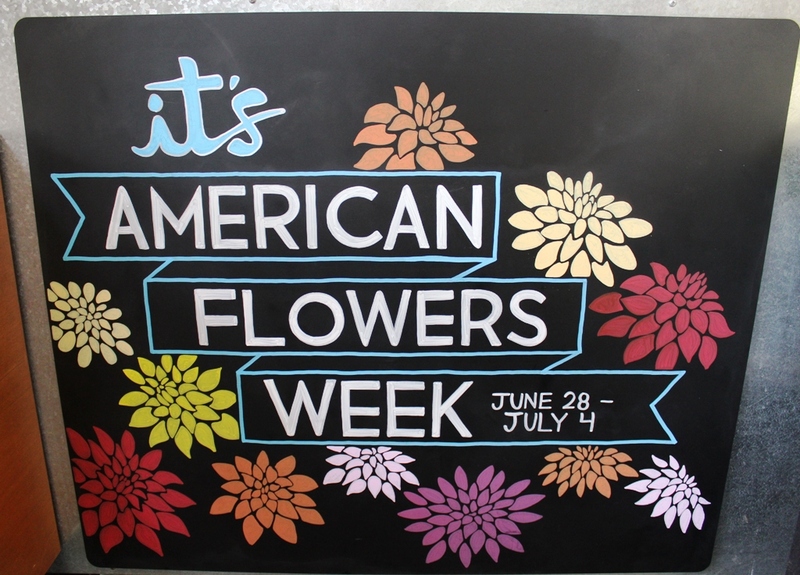 Check out these photos of my visit — I was blown away by the way New Seasons highlighted American Flowers Week!